containment room. Only D-Class personnels are granted permission to be exposed directly to SCP-1674. Any personnels exposed directly to SCP-1674 will be eliminated. 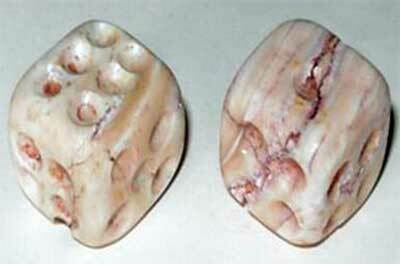 Description: SCP-1674 are two six-sided dices composed of primarily human bones. SCP-1674 was found inside an old cardboard box at an abandoned house in ██████, Indonesia. necessary. Indirect exposure to SCP-1674 caused no effects. The dice appears to be indestructible, although this has not been confirmed. Subjects that rolled SCP-1674 will have their physical and mental abilities multiplied by the numbers shown by SCP-1674. It will also turn the subject into a more violent, vicious person. The radius of SCP-1674 effect is approximately 100 m. The effect lasts for about 3 hours and 30 minutes. However, if the subject leave the area of effect for any reasons, their physical and mental abilities will be divided permanently by the numbers on SCP-1674 the subject rolled before. Once the subject left the area, the the subject can't regain it's former abilities even by rolling the dice again. Addendum A: On 21/07/████, some tests were conducted in which D-87932, a Mongoloid male of 43 years old, was exposed to SCP-1674. D-87932 rolled 5 on SCP-1674-1. D-87932 reported an immense increase in strength, stamina, agility, intelligence and other abilities. D-87932 rebelled the guards and attempted an escape. D-87932 managed to get past the guards and heed towards the containment door. Upon reaching the door, D-87932 was reported to ran out of stamina. D-87932 was immediately neutralized after that incident. Do not attempt to roll both of the dices at once anymore. We've seen the consequences, we don't want it happening again.